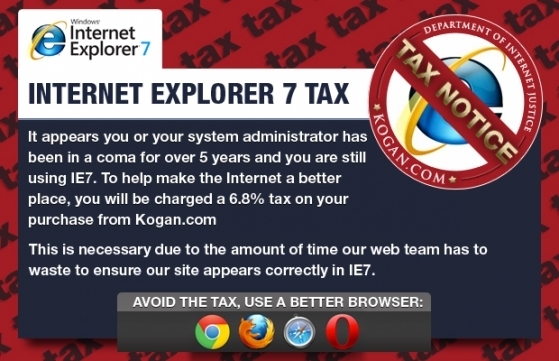 The outspoken Ruslan Kogan has blacklisted users of Microsoft’s Internet Explorer 7 (IE7), imposing an ‘IE7 Tax’ of 6.8% on transactions made via the “antiquated” and “obsolete” browser. 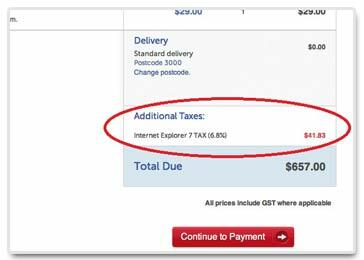 The tax, calculated by adding 0.1% for every month since IE7 was released, comes into effect today on all products purchased from Kogan.com, to recoup the cost of optimising the company’s website for the browser. Founder and CEO of the technology retailer, Ruslan Kogan, says he’s sick of wasting time and money to ensure the company’s new website works on Microsoft’s “obsolete” browser. 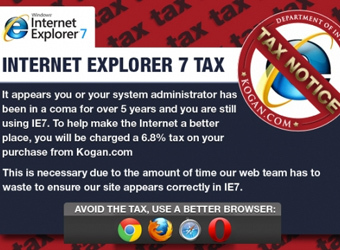 “Internet Explorer 7 has long since passed its use-by date,” Kogan insists. “It’s a constant source of frustration for our web guys and we’re sick of burning cash on a browser that hit the market nearly six years ago. It goes against everything Kogan stands for. “It’s not only costing us a huge amount, it’s affecting any business with an online presence, and costing the internet economy millions of dollars. “Firstly, we are a technology company – so we don’t believe in needlessly sustaining antiquated technology. Customers who enter Kogan’s site using IE7 will be prompted to download an alternative browser from the list of Google Chrome, Mozilla Firefox, Safari or Opera. Internet Explorer versions 8 and 9 will not incur the tax, but are not included in the pop-up box of alternative browsers for users to download.